Hammocks are essential gear for the serious backpacker. While the image of lazy summer afternoons spent lounging in a backyard hammock with a cold drink in hand still prevails. Click here to check out my favorite backpacking hammock choice at Amazon. For the backpacker and expedition adventurer, a quality hammock can provide the difference between abject misery and luxurious comfort. You’ll want to spend some time and effort making this important purchase, but we’ve done some of the homework for you already. We searched the web and found consensus on the top performers in each category. Daytime hammocks: These are meant for rests during a hike, and the chance for the backpacker to get off his feet, and so weight and ease of set-up are crucial here. Nighttime hammocks: These are for sleeping at night off the ground and away from moisture and critters, and so comfort is the most important factor. Camping hammocks: Essentially suspended tents, camping hammocks provide complete shelter for the backpacker, and so durability and protection from the elements are essential features. Weight: We’re considering hammocks for backpackers, not car campers, and so any additional weight on your back has to be worth it. Ease of set-up: As a hiker, your body, mind and spirit are all being put to the test, and so the last thing you want to do is waste precious energy in your pursuit to save it. 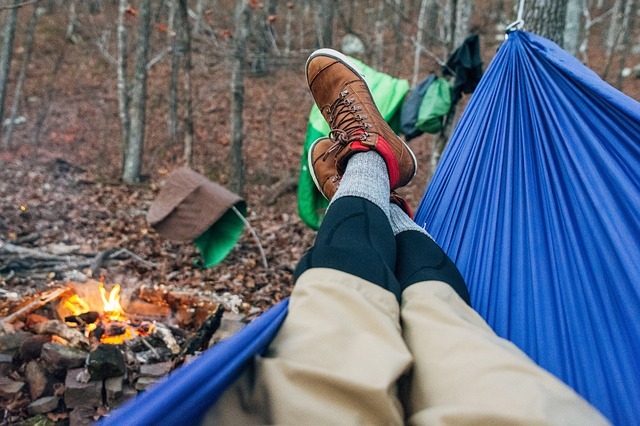 Comfort: Particularly for nighttime hammocks, if you aren’t resting comfortably or falling asleep in your hammock, there’s not much point in setting one up. Durability: If you’re spending considerable money on a hammock, if you’re depending on it for shelter and rest during multi-day expeditions, or if you’re larger than the average bear, your hammock must go the extra mile for you. Price: While it’s true that you generally get what you pay for, the lists we found all included some high performers at budget prices. For ease of comparison, we’ve limited our picks to single-person hammocks, but if you’re hiking with your partner or family member – or if you’re just really cold and desperate – a dual hammock is worth considering, and you can find some good ones in each of the three main categories. The Grand Trunk weighs in at a light 7 ounces. But you’ll need to invest extra for straps. The 7 refers to the weight of the hammock, tipping the scales at just over 7 ounces, and so the Nano 7 is an excellent choice for a lightweight day hammock that made the grade at all the sites we looked at. The Nano 7 uses bent wire carabiners for easy installation, but comes without straps, so you’ll want to make sure to invest a bit more money for these. The Grand Trunk Ultralight is heavier at 12 ounces. But it’ll be much lighter on your wallet. This hammock weighs 12 ounces, so the Ultralight’s name may be a bit of a stretch, but your wallet definitely won’t become significantly lighter with this budget choice. The low price comes at the expense of comfort, with the polyester material not quite as silky smooth as the nylon construction of its pricier cousin. As with the Nano 7, the Ultralight comes without straps. The ENO Sub 7 weighs only 6.5 grams and folds up to the size of a baseball. The Eagle’s Nest Outfitters Sub 7 hammock is the weight leader in this category at just 6.5 ounces. With its lightweight nylon construction and minimalist design, the strapless Sub 7 packs down to the size of a baseball, making it an excellent choice for an easy, light daytime hammock. The top pick for the best day hammock is definitely the ENO Sub 7. Check out the ENO Sub 7 Hammock at Amazon. This Hennessy makes the list with this asymmetric design that keeps the user’s back straighter than a more typical banana-shape hammock. A rainfly and full suspension system are included, for a durable and comfortable package that comes in at a respectable 1.9 pounds. The EON OneLink is comfortable and affordable. But it’s heavy to carry. The OneLink is the most durable and stout of the nighttime hammocks we chose, and users rate its comfort highly. Rugged, high-strength nylon construction will stand up to the harshest conditions on extended expeditions, and the included suspension system provides 30 points of contact, to fit just about any mounting scenario. However, the total weight of 4.8 pounds means that you might be needing to take frequent hammock breaks after toting this behemoth on your back all day. The Seattle-based online retailer offers this durable and comfortable model from its own store brand. The flat-bottom design features strong, permanent poles at both ends for stability, and the built-in bug net can be bypassed by simply flipping the hammock over. Because you are not paying for a brand name, the Quarter Dome also offers excellent value. The top pick for nighttime hammocks is the Hennessy Hyperlight. Check out the Hennessy Hyperlight Hammock at Amazon. This hammock is a true shelter and can alternatively be set up as a tent on the ground. This feature makes it, ironically enough given its name inspired by the eastern Appalachian mountains, a good choice for western environments where trees may be hard to come by, and ground moisture isn’t an issue. Spreader bars for the flat base keep the bed stretched to a roomy 90”x 42”, so it’s an excellent pick for big and tall hikers, or those who are carrying lots of extra gear. The Blackbird has a tough fabric in a double-layer design to keep it durable and impervious to the elements. The fact that all of these features come in a 1 lb, 2 oz package (without a tarp) makes the Blackbird one of the best all-around hammocks out there. Backpackers over 6 feet tall will need to order the Blackbird XLC model. The Patent Camping Hammock comes with everything you need at an affordable price. The Patent Camping Hammock comes complete with all the ropes and tie-downs needed at a budget price and a mid-range weight of 2.8 lbs. The utilitarian and no-frills design ethic make this hammock, like the Warbonnet Blackbird, a good all-rounder. Check out the Patent Camping Hammock at Amazon. So which is the best backpacking hammock out there? This is a tough question to answer, and it’s a bit like asking which is the better car, a Porsche or a Land Rover? One is supremely fast and the other is extremely durable, and the best choices for most people are probably cars that aren’t leaders at either extreme, but which check off measures of competence in a lot of different areas. If you’re an experienced backpacker, you probably already know which category you want your hammock to fall into, and so picking a specialist hammock from that category is an easier task. For those of us just getting into serious backpacking, a good all-around hammock is probably the best option, so choosing one that offers suitability in all three categories is the goal. With this in mind, the Patent Camping Hammock offers the best compromise of weight, comfort and durability, all at an affordable price. And it come with everything you need, so you won’t be forking out for extras. If you’re in the market for a new sleeping pad for your outdoor adventures, look not further than these recommendations. And if a new sleeping bag for your backpack mission is what you need, here are my latest top choices. There’s nothing worse than braving the winter for a long hike with the wrong boots. Ouch! Check out my recommendations for the best boots to beat the winter cold.